Hmmmm, looks like I might have found myself on two online teams for Heritage Jam 2015. The first looks like being more story based, the second more technological. Were I more stupid I’d try and get the two teams working together, but the scope of the second team’s project seems perfect for the time available, and layering story on top would kick it into the realm of impossibility. Also though I know I have one conspirator on the story project, another who expressed an interest has since been silent, so it may not be a team as much as a duo! I have a teleconference with the second team this afternoon, so beforehand I’m pulling together a few links I’ve seen recently about the challenge we have set ourselves: Mobile Location Analytics. All the rage in the world of retail, this is technology that tracks mobile devices around shops and malls (shopping centres), to learn about how the people those devices are attached to, move around the space. A bit creepy, eh? The key thing is that this information is anonymised. The point is not to learn about the behavior of particular individuals, but rather to understand how the spaces work – how long do shoppers have to wait at the tills for example. The (mostly American) companies that provide the anonymised analytics services have grouped together as the Future of Privacy Forum, to agree and promote ethical guidelines for the technology and run a customer facing website that allows users to opt out of tracking. Most of the systems rely on extant wi-fi networks to do the job, as this white paper from Cisco explains. But of course many museums don’t currently have wi-fi throughout their galleries, so the opportunity to use established services, even the free Euclid Express, is limited. So we’ve got an idea about using Heritage Jam as an opportunity to hack a cheap, open source solution for museums, without extant Wi-Fi, wanting to track their visitors around their collections. We’ve got a location that wants to try this out, too. One of the challenges (and luckily the one which I think, being a noninexpert-technologist, I’ll be most useful on) will be working out how we make visitors aware of, and (hopefully) comfortable with, the study and/or give them the opportunity to opt out. If it works, it might even form the basis for a more responsive museum environment, as I described when I was last at York. But we’ll leave that idea until Heritage Jam 2016! Why? Houghton Hall is a place like many of those the National Trust looks after, but still family-owned and managed. David, the current Marquess of Cholmondeley, is, like generations before him, a patron of the arts. Houghton Hall gives us a glimpse of some National Trust places might look like, if patronage and collecting had continued up to the present day. 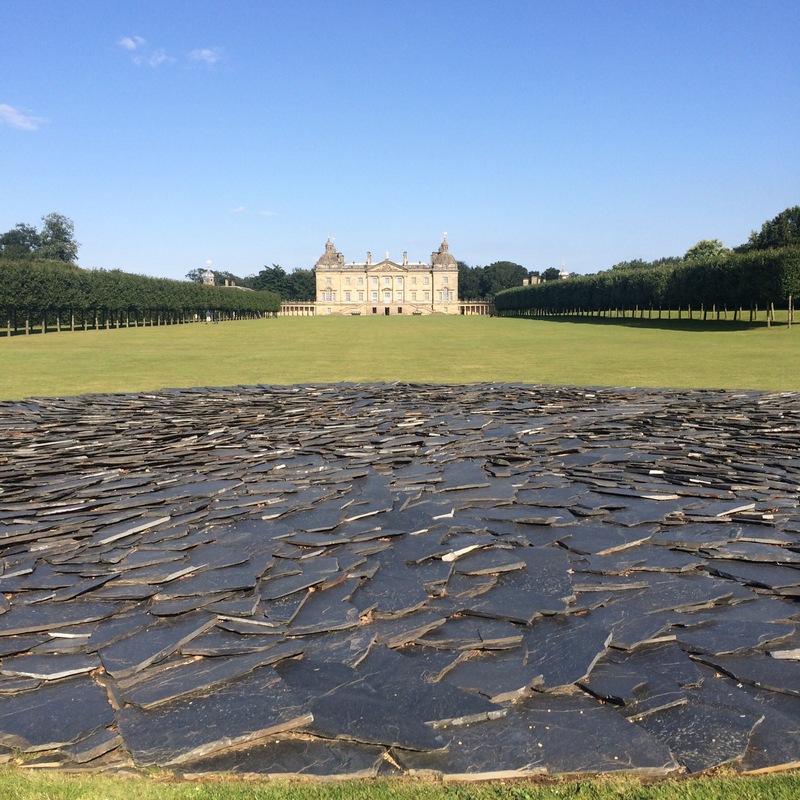 The gardens are a place of surprise and delight, with contemporary sculptures including a Richard Long (above) and, from Jeppe Hein, Waterflame, a burning fountain. But of special interest this year is a retrospective of works by James Turrell, including two permanent commissions for the Houghton Hall landscape. Turrell’s deceptively simple works are incredibly powerful, and you’ll likely never again have a chance to see so many together in the same place. But it’s not just the art, the service is exemplary. And for the late night openings on Fridays and Saturdays, there’s a pop-up café, in keeping with spirit of place, that we can all learn from. Yes it’s a little bit out of the way for those of us who don’t live in Norfolk, but make a weekend of it, it is worth it. I woke up this morning with the day planned out in my head. I was doing to listen to everything I could find by a composer I hardly knew on Apple Music, while digging out a bunch of index cards and a marker pen. I was going to, in script-writing terms, “break” my story. I had a ghost of a graph in my head, and very specific ideas about a running time (45 minutes max, if you are interested). I had all sorts of story elements buzzing around too: a moment of disorientation as with waking from (or falling into) a dream; a conversation with a “genius loci”; a revelation which may have been a moment of self-realization (“am I … a slave?”); too many more to list. But I had only the vaguest idea which ideas I should use, and what order they should do in. I knew there WAS an order, or that one would become apparent, because order is what turns events into kernels and facts into narrative. I wasn’t even sure how many narratives I’d find, but I wasn’t worried about that. I could discard or include as many as I wanted. What I needed to do was move events around on my dining room table (or the floor) and see what emerged. Maybe take some photos, or maybe if things went really well, transcribe everything into Scapple. That’s was the plan. It didn’t work out. Moments before I got an email from my prospective teammate saying what a great idea it was, I got an email from the stakeholders I really need approval from, saying that approval wasn’t forthcoming. So, I need another idea, and I’ve been thinking what that might be. Yesterday afternoon, after the theme was announced, I was bouncing off the walls. The theme was almost too good – there were too many possibilities. I was buzzing with them – I couldn’t sit down. I had to find things to do, like washing up, or bringing the washing in, to calm my brain down. When the idea finally came, it seemed so obvious, so perfect, I couldn’t quite work out why I hadn’t thought of it first. But this morning has been very different. The energy has been sucked out. Everything I think of, every other idea I had yesterday, comes up wanting against what I really want to do, but can’t. Yesterday afternoon was full of possibilities, this morning has been full of barriers. The theme for Heritage Jam 2015 was announced today, and booking opened. The theme is Museums and Collections, which is so far up my street, its on my front step, knocking on the door! So I signed up for the In Person element at University of York (maybe showing too much eagerness, I think I may have been the first). And while I’ve not yet signed up for the On-line element (which runs until the eve of the York event, 24th September), I do have a great idea for it. By the way if you want to sign up, you have until the 24th August, which isn’t what I said in my earlier post.